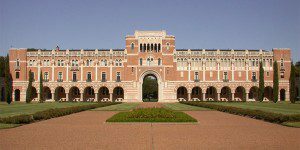 MBA@Rice is the online MBA program from Rice Business, ranked a top-10 business school in the nation by Bloomberg Businessweek. The program helps a diverse community of aspiring business leaders build both foundational and specialized skills as they examine modern business challenges in the context of real-world scenarios. The program is led by the same renowned faculty who teach on campus. Rice Business is also the highest ranked business school in Texas by Bloomberg Businessweek and ranked No. 2 in the nation for graduate entrepreneurship studies by The Princeton Review for 2018. ● Live classes hosted in a face-to-face online classroom. ● Interactive coursework that draws upon real-world scenarios. ● Networking opportunities with a diverse group of accomplished leaders. ● Resources and research from the distinguished Rice Business community. MBA@Rice seeks ambitious professionals with a diverse array of experiences, backgrounds and skillsets. A bachelor’s degree from an accredited institution is required, as well as valid GMAT or GRE scores from no more than five years prior to the date of applying. Class start dates are available in January, April, July and October each year, and applications are accepted on a rolling basis.